Warm, summer outside air is always seeking a cooler area. The underside of a crawlspace or unfinished/unconditioned basement is cooler than outside air which pulls the warmer air into the structure through any opening available. This creates condensation on all surfaces increasing the relative humidity of the area, resulting in those areas staying wet which will eventually lead to mold, mildew, fungus, and rot. Pest and wood ingesting insects such as beetles, termites, and ants can be another problem. I recommend a closed crawlspace (instead of venting) in combination with UltraBan PRO. 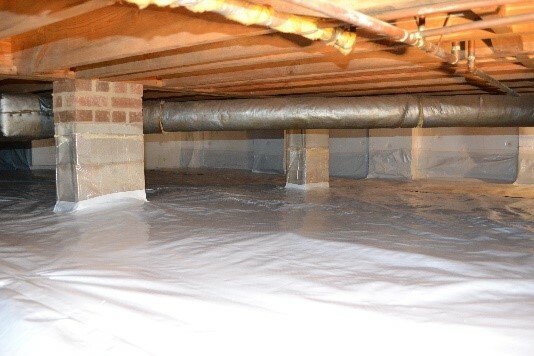 This product is specifically designed to help control moisture and provide a barrier of protection in the closed crawlspace and unfinished basement areas. UltraBan PRO helps prevent moisture from penetrating the surface while still allowing it to breathe. Its advanced chemistry, combined with borates, prevents harmful moisture from being trapped inside the surface. Controlling the moisture will help prevent mold/mildew from growing and wood ingesting insects from infesting your home. PRO should be an integral part of any unfinished basement/crawlspace moisture prevention program. UltraMean2 is the first step in the crawlspace treatment program. It is an industrial grade peroxide-based cleaner that sanitizes and removes mold spores and is not harmful to wood or fiber surfaces like chlorine bleach products are. UltraMean2 is perfect for applications in enclosed areas and tight spaces as it contains no harsh chemicals or fumes. Use UltraMean2 to clean all surfaces prior to applying UltraBan PRO. For more information on these products, please visit rhinohide.com or call 863.665.0203. Use reference number #770PH. Solar-SNAP is a highly reflective foil material that has been used for more than 50 years to reduce heat in attic spaces. It has been shown to be very effective for the home and it is not uncommon to reduce the ambient temperature by 20 degrees. This temperature reduction reduces the workload of the HVAC equipment and can save the homeowner up to 35% of home energy costs. Solar-SNAP does not replace the need for attic insulation, but assists in reflecting heat away from the area keeping the home cooler in the summer and warmer in the winter. In addition, ice formulation on roof and soffit areas is greatly reduced when radiant barriers are installed. Typically radiant barrier installation is very demanding and is labor intensive. Solar-SNAP is the first and only easy to install “roll up” radiant barrier system. It installs in 1/4 the time of staple-up radiant barrier products. For more information visit rhinohide.com/solar-snap/ or call 863-665-0203 and use reference #770PH.